Cognitive behavioural therapy (CBT) is a psychological intervention that aims to alleviate anxiety by helping the patient to modify their unhelpful, erroneous cognitions and safety-seeking behaviours (Beck 1976; Clark et al. 1999). Tinnitus is perception of sound in the ears or head with no acoustic stimulation. People typically describe their tinnitus as buzzing noise, high-pitched noise, hissing noise, whistle, waterfall and grinding wheel, ringing, white noise, wind noise, bubbles, clicks, beep, or humming noise. About 20% of patients are unable to describe what their tinnitus sounds like. Hyperacusis is intolerance to certain everyday sounds that causes significant distress and impairment in social, occupational, recreational, and other day-to-day activities. Intolerance to certain sounds related to eating noises, lip smacking, sniffing, breathing, clicking sounds, and tapping noises is also known as misophonia or annoyance hyperacusis. What is the research evidence in support of CBT for tinnitus? Two systematic reviews have led to the conclusion that CBT delivered by psychologists in a research setting helps patients to reduce the effect of tinnitus on their lives (Martinez-Devesa et al. 2010; Hesser et al. 2011). Audiologist-delivered CBT is focused on managing hyperacusis/tinnitus/misophonia-related distress and patients with symptoms of co-morbid psychological disorders should be referred to mental health professionals for assessment and appropriate management of their psychological symptoms. Given the high prevalence of anxiety and depression symptoms among patients with tinnitus/hyperacusis, most patients generally have some form of mental health treatment prior to be referred to audiology for tinnitus and hyperacusis management. If not then this should be identified promptly and appropriate actions to be taken. In collaborative work between specialists in audiology and clinical psychology, Aazh and Allott (2016) published a protocol for audiologist-delivered CBT for hyperacusis rehabilitation. More recent studies published in the International Journal of Audiology and the American Journal of Audiology evaluated the feasibility and clinical effectiveness of CBT specialized on tinnitus and/or hyperacusis rehabilitation (Aazh & Moore 2018b; Aazh & Moore 2018a). These studies reported “medium” and “large” effect sizes. They concluded that audiologist-delivered CBT led to significant improvements in self-report measures of tinnitus and hyperacusis handicap and insomnia. 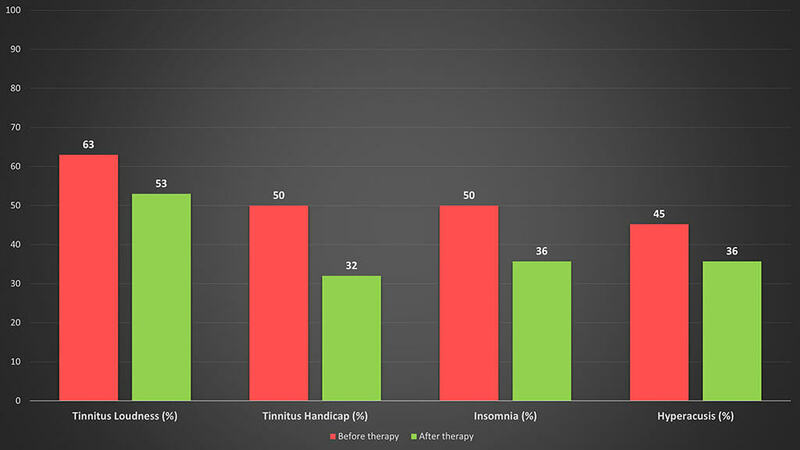 Figure below is the results of a recent service evaluation conducted by Dr. Aazh’s tinnitus team on over 500 patients illustrating the change in the mean of tinnitus loudness, tinnitus handicap, insomnia and hyperacusis handicap as measured via Visual Analogue Scale (Adamchic et al. 2012), Tinnitus Handicap Inventory (Newman et al. 1998), Insomnia Severity Scale (Bastien et al. 2001), and the Hyperacusis Questionnaire (Khalfa et al. 2002). All the changes were statistically significant. 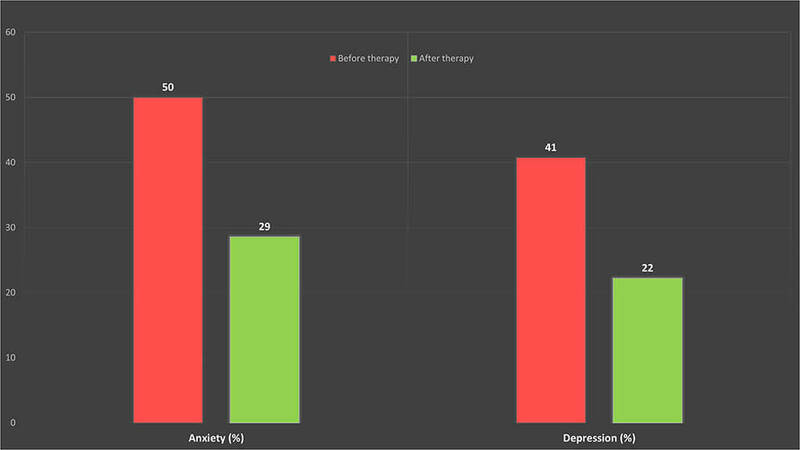 As shown in the graph below there are considerable improvements in tinnitus-related anxiety and depression scores as measured via Generalized Anxiety Disorder (GAD-7) (Spitzer et al. 2006), and the Patient Health Questionnaire (PHQ-9) (Kroenke et al. 2001), respectively. All the changes were statistically significant indicating that the anxiety and depression symptoms in this population were likely to be associated with tinnitus and/or hyperacusis hence a specialised CBT focused on minimising tinnitus and/or hyperacusis-related distress have led to improvements on GAD-7 and PHQ-9. Adamchic, I., Langguth, B., Hauptmann, C., et al. (2012). Psychometric evaluation of visual analog scale for the assessment of chronic tinnitus. . American Journal of Audiolgy 21, 215-225.
and Therapy of Depression. New York: Wiley. Hesser, H., Weise, C., Westin, V. Z., et al. (2011). A systematic review and meta-analysis of randomized controlled trials of cognitive-behavioral therapy for tinnitus distress. Clin Psychol Rev, 31, 545-53. Newman, C. W., Sandridge, S. A., & Jacobson, G. P. (1998). Psychometric adequacy of the Tinnitus Handicap Inventory (THI) for evaluating treatment outcome. J Am Acad Audiol, 9, 153-60.